Mars formed within two to four million years of the dawn of the Solar System, much faster than the Earth which took between 50 and 100 million years to reach its final size, which could explain why Mars is so small, say scientists reporting their discovery in the journal Nature. Mars is just 11 percent the mass of Earth, yet the dynamics of planetary formation say that Mars should have grown to a comparable size as its bigger siblings Earth and Venus, accumulating mass from smaller planetesimals. But Mars never seemed to make it out of the planetary nursery. “Earth was made of embryos like Mars, but Mars is a stranded planetary embryo that never collided with other embryos to make an Earth-like planet,” says Nicolas Dauphas at the University of Chicago. “We thought that there were no embryos in the Solar System to study, but when we study Mars, we are studying embryos that eventually made planets like Earth,” adds colleague Ali Pourmand of the University of Miami. 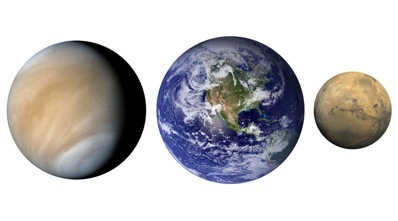 Earth and Venus are near-twins in size, but Mars is the runt of the trio. Image: NASA. The ratios of radioactive elements hafnium, tungsten and thorium were key players in Dauphas and Pourmand's derivation of the refined age for Mars. When planets form, they differentiate into an iron-rich core and a silicate-rich mantle. Since tungsten likes to bond with iron, it can be found in the core, while hafnium remains in the mantle, the viscous layer of rock beneath a planet's crust. Core formation is thought to occur at around the same time that a planet reaches its final mass, so the tungsten isotopic ratio recorded in the core provides its age. But studying the radioactive decay of elements in the mantle, specifically hafnium-182 to tungsten-182, to home in on Mars' age yielded a wide range of answers because they are derived from meteorites that were produced during melting events, and thus had their radioactive clocks tampered with. The team were able to close in on some of those uncertainties by looking at both Martian meteorites and non-Martian meteorites such as chondrites, which contain pristine samples of the early Solar System and thus are a reliable way of determining ages, and comparing the compositions of both. Furthermore, since thorium and tungsten have a similar chemical behaviour, it was possible for the scientists to determine the relationships between hafnium, thorium and tungsten. Therefore, using thorium as a substitute for tungsten, to derive the Martian mantle’s hafnium-thorium ratio, they divided the thorium-tungsten ratio of the Martian meteorites by the thorium-hafnium ratio of the chondrites. Plugging the derived ratios into computer models for planetary formation revealed that Mars must have reached half its present size only two million years after the formation of the Solar System. For some reason Mars was starved of planet-building material early on. Just why is yet to be determined but the gravitational battle between growing planets in both the inner and the outer Solar System may be to blame. In the meantime, Dauphas says that a fast-forming Mars explains the similarity in the xenon content of its atmosphere with that of the Earth. “Maybe it’s just a coincidence, but maybe the solution is that part of the atmosphere of Earth was inherited from an earlier generation of embryos that had their own atmospheres, maybe a Mars-like atmosphere,” he says.